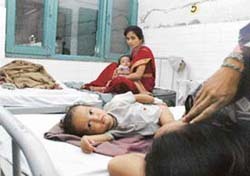 At least three dozen cases of mild attack of gastroenteritis have been reported from Bhagat Singh Colony near Sherpur in Ward No 18 and some other localities in the city during the past two days. Monsoon has spelt doom for farmers in at least 15 villages along side Budha Nullah. Affected farmers claim that crop worth lakhs of rupees has been innundated due to overflowing of nullah waters. The state Director-General of Police, Mr S S Virk, today directed officials of the Ludhiana Range police districts to take menace of land mafia head-on, besides protecting human rights of the accused or individuals held under suspicion of involvement in a crime. The Congress will come into power in the next Assembly elections again as the rival party, Shiromani Akali Dal (SAD), has no programme for the people, claimed Mr Jasmeet Singh Raja, state general secretary of the Youth Congress. The district administration will set up suvidha, camps in the district to provide on the spot services to public to eliminate harassment by middlemen, delays and corruption in the delivery of services to people. To protest against the postponing of General House of the Ludhiana Municipal Corporation scheduled for today, the Opposition councillors staged a dharna outside his office. The Bharti Kisan Union (BKU) has flayed the decision of the government to give the money earmarked for strengthening the infrastructure in the villages to other organisations. The new gate of Maharaja Aggarsain Park was inaugurated by Mr Joginder Pal Singh, President, Municipal council, Mandi Gobindgarh, today. The marble statue of the Maharaja costing Rs 5 lakh was installed in the park. Several local Congress leaders today hailed the appointment of Mr Shamsher Singh Dullo as president of the Pradesh Congress Committee. There is an increased risk of diseases during the monsoons, says Dr Jugesh Chattwal, Professor and Head, Paediatrics, Christian Medical College and Hospital here. Children and infants with a weaker immune system are particularly vulnerable to seasonal diseases. Encroachments on the GT road is a common sight here causing inconvenience to commuters. 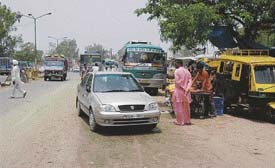 At a roundabout on the GT road where roads from four sides — Ludhiana, Ferozepore, Jagraon and Jalandhar meet one can see rehriwalas and the sheds of shopkeepers reaching uptill the road, creating problems for the vehicles. Senior BJP leader and former MP, Lajpat Rai has expressed surprise saying how a person of Dr Manmohan Singh’s status could praise the British rule in India. Lok Sabha Deputy Speaker, Charanjit Singh Atwal today met Prime Minister Manmohan Singh, seeking his intervention in preventing attacks on gurdwaras in England in the aftermath of bomb attacks in London. A deputation of the gram panchayat and residents of Otalan, 3 km from here, met Mr Baldev Singh, SDM, in connection with the damaged village “phirni” and lanes and bylanes due to diversion of the traffic on the Samrala-Khanna road for the past two months. Apropos the report carried in Ludhiana Tribune in its issue dated July 13 about the critically ill youth, Sanjay Choudhry, admitted to Christian Medical College and Hospital here, the report mentioned erroneously that the hospital had not waived charges for admission and other investigations. The Sidhwanbet has registered a case, against Salinder Singh of Swaddi Khurd for having, relations with Punjab terrorists. Salinder is now based in Germany. He reached there allegedly using a forged passport. He also alleged sponsors terrorists and provide them with money, arms and explosives. The police has impounded a Tata Sumo vehicle. No arrest has been made so far. Two persons have been arrested and eight bags of poppy husk seized form them. Three persons died and two were hospitalised after consuming liquor at Bhatian village yesterday. The deceased were cremated today morning at the village cremation ground. The Division No 4 police this evening arrested two persons regarding the gory murder of a married woman, Mamta, who was found dead on July 8 in a car near Daresi Grounds. Punjab Agricultural University (PAU) has decided to implement the pest management strategy on cotton. According to Dr GS Deol, Head, Department of Entomology, PAU insect pest management plays a significant role in obtaining sustainable yield of seed cotton. Vegetable prices have increased by almost three times in the past 15 days due to incessant rains. Problems in transportation, have reduced the supply, resulting in increased prices. Students, teachers and parents are happy with the decision of the CBSE to stop the schools from conducting multiple pre-board examinations. Kangaroo Kids , a playway school, organised a fun party for its students at the reopening of the school here today. The school arranged a splash party filling a huge pool with water . In the wonderland room, the tiny tots enjoyed the rain dance where artificial rain was created for them. The students watched a movie show. The National Institute of Fashion Designing held its annual convocation here today. 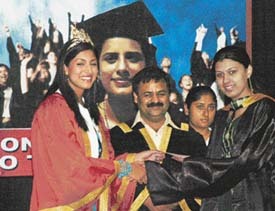 Ms Sindura Gadde, Miss India-World 2005, awarded degrees to the students. Mr M.S.Jaggi, SDM (West), was the guest of honour. Mr Charan Singh Sarabha, general secretary, Government School Teachers’ Union, Punjab, Jagmel Singh Pakhowal, district president, Mr Charan Singh, Tajpura district general secretary, though a press note said leaders of the union met unemployed. E.T.T. 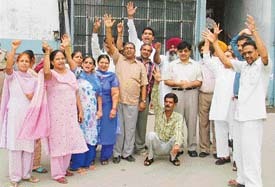 teachers detained in Central Jail and found them in high spirits. No teacher would apply for bail. Ms India-World 2005, Sindura Gadde, wants to adopt a child once she becomes financially and emotionally independent. Inspired by her role model Sushmita Sen, Sindura says she is a perfect blend of beauty and brains. The talent hunt for the voice of Punjab by MH 1 has gone on air. 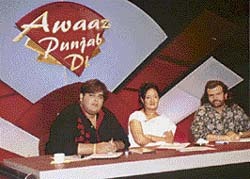 ‘Awaaz Punjab Di’, the talent hunt by MH 1, went on air yesterday. The contest started in Chandigarh and went to Amritsar, Ludhiana and then Delhi. The members of the jury are Hans Raj Hans, Jaspinder Narula and Sachin Ahuja. A meeting of the Vishal Dangal Committee here was held at Durga Mandir under the presidentship of Mr Tarlochan Singh Kang in connection with the August 13 wrestlers’ meet.